I upgraded my desk at home a bit with a new monitor – A Samsung P2770H – a pretty decent 27″ 1080P display. I was wondering how I might calibrate it and the pair of 24″ displays next to it to have reasonable color matching and ran across this article on doing the job with your digital SLR. First off, this is a great idea. 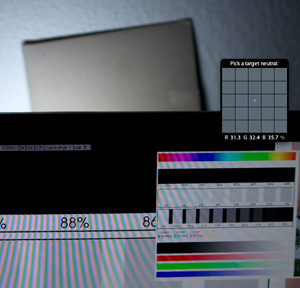 DSLR manufacturers put alot of time and money into color calibration. The main trick is to have a neutral grey to get things correct. There are some caveats for this: Using a neutral gray card will allow you to calibrate your colors to match the lighting/ambiance in the room. This could result in a funky calibration, but mostly due to ambient lighting and reflective surfaces. Your monitor doesn’t reflect color so you could get some odd results. However, you should end up with a decently balanced color wheel.